To determine zooplankton fauna of streams flowing into Darlık Reservoir, which supports im-portant part of drinking water demand of Istanbul, zooplankton samples were monthly taken from 5 selected sampling stations between October 2008 and September 2010. The zooplank-ton community of the study area is composed of mainly Rotifera, Copepoda and Cladocera groups. During the study period a total of 39 taxa was observed, and 25 taxa of Rotifera, 7 taxa of Copepoda and 7 taxa of Cladocera were identified. Rotifera comprised 47.8%, Copepoda 43.9% and Cladocera 8.3% of the total zooplankton. The Shannon–Wiener diversity index values fluctuated in the range of 2.4 and 3.1 for stations. Zooplankton diversity index varied seasonally between 1.1-3.4. Generally, the higher values and higher temperature showed a higher zooplankton diversity indexes. 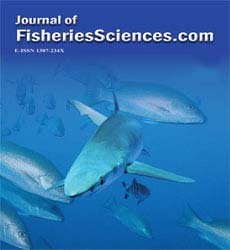 In this study, also dissolved oxygen, conductivity, pH and water temperature were determined and results were determined at the suitable intervals for habitat choice of identified zooplankton species. All zooplankton species identified are the first record for the study area.